Please Stand By gets points for its sensitive portrayal of Star Trek fans and people with autism. Trekkies are generally depicted as annoying geeks with a tenuous grasp on reality ala The Big Bang Theory. Meanwhile, Rain Man is the first thing that likely pops into people’s heads when they hear the word autism. The truth is far more nuanced. Please Stand By comes from director Ben Lewin, whose last feature film was 2012’s The Sessions, which garnered a slew of awards recognition for lead actors Helen Hunt and John Hawkes. The screenplay was penned by Michael Golamco, a writer for NBC’s Grimm, and adapted from his one act play. 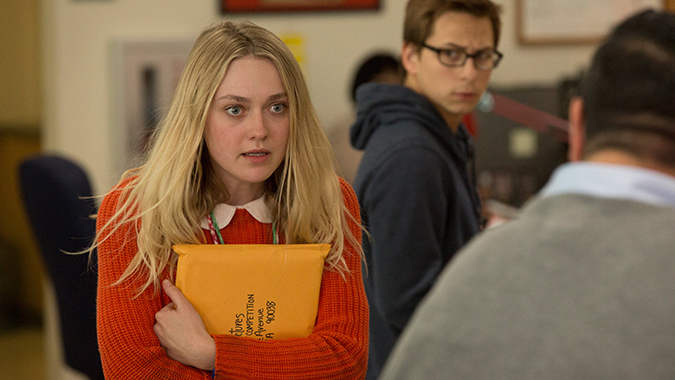 Dakota Fanning takes the lead as Wendy Walcott, a young woman on the autism spectrum though the ‘a’ word is never explicitly said in the movie. She is a resident at an assisted living facility in San Francisco under the care of her doctor, the aptly named Scottie (Toni Collette). Wendy is also a devotee of Star Trek and obviously identifies with Spock’s inability to relate to the complex emotions of his shipmates. Paramount Pictures has called upon Trek fans from around the world to submit their screenplays for a contest to celebrate the 50th anniversary of the franchise. Wendy has written a 450-page magnum opus in the hopes of winning the big cash prize. The money would be used to assist her older sister, Audrey (Alice Eve in a nice bit of meta casting), who has recently had a baby and is selling their childhood home. However, when Wendy learns she’s in danger of missing the deadline, she sets out on a journey to Hollywood accompanied only by her chihuahua, Pete. Along her pilgrimage to Los Angeles, Wendy meets strangers who show her kindness, cruelty, and a little indifference. One of the highlights is Patton Oswalt as a police officer who puts her at east with his fluency in Klingon. Tony Revolori from The Grand Budapest Hotel and Spider-Man: Homecoming pops in briefly as Wendy’s coworker at Cinnabon, who clearly has a thing for her. It’s a tiny subplot within the film, but done with a tender touch, you wish there they had gotten more screen time together. For her part, Dakota Fanning is excellent in the lead role. She has an innate vulnerability while managing to portray Wendy as a capable young woman. Best of all, Fanning never dips into the type of overly mannered performance that plays into the stereotypes of autism. Meanwhile, Toni Collette is perfectly cast as the de facto maternal figure. The video is presented in anamorphic widescreen with an aspect ratio of 2.40:1. The audio is presented in DTS-HD 5.1 Master Audio. Making of Please Stand By (6:27) is a behind-the-scenes featurette that’s loaded with clips and snippets of interviews with the cast and crew. Rounding out the bonus features are four deleted scenes, a theatrical trailer, and previews for other Magnolia releases. Overall, Please Stand By delves about as deeply and richly into the subject matter of autism as you’d expect from a 90 minute indie dramedy. Still, any problems dealing with predictability are alleviated by an undeniable sense of warmth and a strong cast.